Eneda Tarifa was born on 30 March 1982 in Tirana. Since she was six years old she has been demonstrating her talent for music by taking part in different activities at school. Later she studied philosophy and sociology. In the course of her career as an artist, she has taken part in various concerts and charity events. In 2003 she has first competed in Festivali i Këngës 42 (on it's first year as Eurovision Song Contest preselection) with the song "Qëndroj" qualifying to the finals of competition. In 2006 she has finished 4th in Kënga Magjike 8 with "Rreth zjarrit tënd", also getting Çesk Zadeja-award. The next year she was 10th in Festivali i Këngës 46 with "E para letër". She also took part in "Polifest" 2007 with "Mos Harro". In 2008, she again competed in Kënga Magjike with "Zeri im" and was awarded the "Çmimi Fun Tune" award. In December 2009 she appeared in Festivali i Këngës 48 as guest singer on a duet night with Anjeza Shahini with song "Në pasqyrë", which eventually finished second, just behind Juliana Pasha. In 2010 Tarifa won Top Fest 7 on Top Channel with the song "Më veten". She was also chosen to host program Porto Kalli on Top Channel. In 2013 she has released hit "Ika Larg" and currently is working on the debut solo album to be released at the time of Eurovision in Stockholm. This year's Albanian Eurovision Song Contest representative is a true multi-talent: Eneda has written the lyrics to several songs for children and she has been a member of several juries for young talents. She has also demonstrated her skills as a director, together with one of Albania's most acclaimed stars Arjan Culiqi. Together they created the comical soap opera Piruet which resulted in a huge success. Eneda is in relationship with composer Erjon Zaloshnja, and in 2013 gave birth to the couple's first child, daughter Aria. 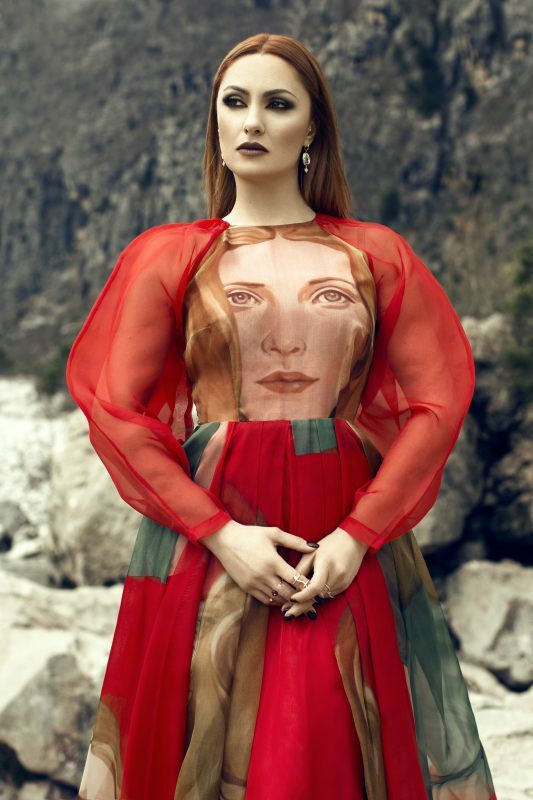 At the Eurovision Song Contest Eneda Tarifa will perform English version of her Festivali i Këngës 54 winning song Përrallë (Fairytale) composed and written by Olsa Toqi with arrangement by Shpëtim Saraçi. English version titled "Fairytale" was presented alongside music video on 13 March in RTSH evening news at 20:00 CET. "I feel like a queen. I was living my dream and the dream came true. I just want to do my best to represent Albania as it should be. I would like to thank everybody who has worked and will work in the future on the project to achieve best quality of the song. Representing Albania is not only a good point of my career, it's also some experience which Albania should live, as we're new in Eurovision and we should create our history in it, and once it's created we will get the first prize one day"
"Eurovision is important because the audience is the biggest ever for my career. The show is fantastic, well organized and I was warned by other artists that have participated before that this was a very impressive organization, an experience that you should try at least once in your life if you are a singer. And last but not least, to represent my country, Albania, which I love", says Eneda. She says she was originally unsure that she would sing the song because it was a challenge for her. As three most interesting facts about her entry Eneda cites: "Way of singing which is a bit special (with exclamations) that makes the song sound different", "The beat which is sensual, well mixed with light Albanian motives", "Backing vocals are important in the song which gives a populist element to the whole". At the Eurovision stage Eneda will be joined by three backing vocalists: Venera Lumani, winner of The Voice of Albania, Besa Krasniqi, Albanian singer who lives in Sweden and competed in the national preselection this year and Xhoni Jesku. "We will be continuing traditions of the Festival, at the same time trying to repair disappointments of some artists of the past. I tried to recall artists who had lost faith in the festival. Unfortunately, the festival has such; a competition always leaves unhappy people behind. The idea is to minimize the unpleasant things of the past festivals. I'm not saying that ours would be perfect, but I would expect the best", - says artistic director Elton Deda, adding that the priority is to respect the creators and performers competing in this season and providing them the best possible from technical and human side conditions. As usual RTSH Festivali was held in three days - on 25, 26 and 27 December at the Palace of Congreses in Tirana. Shows were hosted by journalist, director and songwriter Pandi Laço (wrote ESC 2005, 2007 and 2008 entries) and RTSH presenter Blerta Tafani, while Kosovan actress Gresa Pallaska who was originally planned to be third presenter has withdrawn due to the conflicting schedule. In the first two Semifinal nights 15 songs were presented, of which 11 have qualified to the Final. Thus on the final night had competed 22 songs. Invitation for the participation was published on 8 August. Entries were accepted by RTSH on 29 and 30 September. Artists/composers wishing to compete in the festival were eligible to submit only one entry, while lyricists were eligible to enter 2 songs. From 70 entries submitted to the broadcaster, 30 have been chosen to compete in the Festival. Radio Tirana through December was playing the studio versions of the competing entries to increase interest to the Festival. Songs and interviews were presented every day from 4 December at 16:00 CET in Gjithçka Shqip program hosted by Andri Xhahu and Artemisa Ded (online). The songs have also been released on Festivali website: 1st semifinal, 2nd semifinal. Besa Krasniqi, Swedish - Albanian singer who is best known in Kosovo, became the first Swedish to participate in the Festival. 19 of this year's participating artists have participated in the competition at least once since the year 2003 when it became the official selection for the Eurovision Song Contest. Entela Zhula and Kozma Dushi both participated five times in the competition since 2003. Flaka Krelani, Klajdi Musabelliu and Evans Rama participated four times. In the line-up there are two former winners of the competition: Adrian Lulgjuraj (won Festivali I Këngës 51 with Bledar Sejko) and Luiz Ejlli (won Festivali I Këngës 44). Among others, Klajdi Musabelliu and Erga Halilaj have been on the Eurovision Song Contest stage before as backing vocalists. On 26 November Edea Demaliaj has withdrawn from the Festivali, after her request to replace the entry "Era" (Adrian Hila - Pandi Laço) has been declined by organizers. She has been replaced by Orgesa Zaimi. Members of the professional jury which evaluated performances were: Ilirian Zhupa (lyricist), Piro Çako (songwriter), Helidon Haliti (painter), Françesk Radi (singer), Olta Boka (singer), Jehona Sopi (singer) and Alban Nimani (lead singer of the band "Asgjë Sikur Dielli"). Albanian violinist Shkëlzen Doli, member of the Vienna State Opera and Philharmonic Orchestra, as well as Aleksandër Gjoka, Redon Makashi, Françesk Radi, Luan Zhegu and Mefarete Laze were special guests of the final show, while appearance of Eurovision 2014 winner Conchita Wurst was cancelled shortly prior the show for the second year in a row. Final show was also broadcasted on RTK (Kosovo) and MRT 2 (Macedonia). Энеда Тарифа родилась 30го марта 1982 года в Тиране. С шести лет она демонстрирует свой музыкальный талант, принимая участие в различных школьных мероприятиях. Позднее она изучала философию и социологию. Энеда обладает более, чем 10-летним опытом выступлений на крупнейших музыкальных фестивалях и других музыкальных мероприятиях Албании. В 2003 году она впервые приняла участие в Festivali i Këngës 42 (в первый год, когда он стал являться также отбором Албании на Евровидение) с песней "Qëndroj", выйдя в финал конкурса. В 2006 году она стала 4й в Kënga Magjike 8 с "Rreth zjarrit tënd", также получив премию Çesk Zadeja. В следующем году она вновь принимает участие в Festivali i Këngës 46 и становится 10й с "E para letër". Также она выступает на "Polifest" 2007 с "Mos Harro". В 2008 году Энеда возвращается на Kënga Magjike с песней "Zeri im" и становится обладательницей премии "Çmimi Fun Tune". В декабре 2009 года она выступает в Festivali i Këngës 48 в качестве гостьи, исполнив в один из вечеров дуэт с Аньезой Шахини на песню "Në pasqyrë", которая в итоге стала второй, уступив Юлиане Паше. В 2010 году Тарифа одерживает победу на Top Fest 7 на Top Channel с песней "Më veten". Также она становится ведущей телепрограммы Porto Kalli на Top Channel. В 2013 году она выпустила хит "Ika Larg" и сейчас работает над дебютным альбомом, который планируется выпустить во время Евровидения в Стокгольме. Представительница Албании этого года обладает множеством талантов: Энеда писала тексты к детским песням, и заседала в жюри конкурсов молодых талантов. Она также демонстрировала свои умения как режиссер, работая с одним из наиболее популярных мастеров Албании Арьяном Цуличи. Вместе они создали юмористическую мыльную оперу Piruet, которая пользовалась большим успехом. Энеда уже много лет состоит в отношениях с композитором Эрйоном Залошней, и в 2013 году родила своего первого ребенка - дочь Арию. На Евровидении 2016 Энеда исполнит английскую версию своей песни-победительницы Festivali i Këngës 54 Përrallë (Fairytale), которую написала Олса Токи, а аранжировку подготовил Шпетим Сарачи. Премьера английской версии, получившей название "Fairytale Love" прошла 13го марта в эфире вечерних новостей телеканала RTSH в 22:00 Москвы. "Я чувствую себя королевой. Я жила мечтой и теперь эта мечта сбылась. Я хочу сделать все, чтобы представить Албанию с наилучшей стороны. Мне хотелось бы поблагодарить всех кто работал и будет работать в будущем над проектом доведения песни до наивысшего возможного уровня качества. То, что я представлю Албанию на этом конкурсе - это не просто важный шаг для моей собственной карьеры, но и определенный опыт, который должна накапливать Албания. Мы все еще в достаточной степени новички на Евровидении, и только с накоплением опыта однажды мы сможем побороться за первое место"
"Евровидение очень важно для меня, поскольку его аудитория - самая большая в моей карьере. Это - фантастическое шоу, прекрасно организованное, о чем мне рассказывали мои коллеги, уже принимавшие в нем участие. Они же советовали мне, что это тот опыт, который нужно испытать любому исполнителю хотя бы один раз в жизни. Ну и для меня очень важно, что я буду представлять свою страну Албанию", говорит Энеда. Она рассказывает, что изначально даже не была уверена, согласится ли она петь эту песню, потому что для нее это было определенным вызовом. В качестве наиболее интересных фактов о песне, она называет: "Стиль пения, который весьма особенный (с восклицаниями), который заставляет песню звучать по-другому", "Чувственный бит, который смешан с легкими албанскими мотивами", "Бэк-вокал, который очень важен в песне и придает народное ощущение всей песне в целом". На сцене Евровидения с Энедой выступят три бэк-вокалистки: Венера Лумани, победительница Голоса Албании, Беса Красниджи - Албанская певица, проживающая в Швеции, принимавшая участие в отборе этого года, и Джони Йеску. "Мы будем продолжать традиции Фестиваля, в то же время пытаясь исправить разочарования многих артистов от прошлых лет. Я постарался пригласить к участию артистов, которые потеряли ранее веру в фестиваль. К сожалению, у фестиваля есть и такие; после конкурса всегда остаются недовольные люди. Моя идея заключается в попытке минимизировать неприятные моменты, имевшие место на прошлых фестивалях. Я не говорю, что наш будет идеальным, но я ожидаю лучшего", говорит артистический директор Элтон Деда, добавляя, что приоритет будет заключаться в уважении авторов и исполнителей, принимающих участие в этом сезоне, и предоставлении им наилучших возможных с технической и человеческой стороны условий. Как обычно, RTSH Festivali прошел в три дня - 25, 26 и 27 декабря, во Дворце Конгрессов в Тиране. Ведущими шоу стали журналист, режиссер, автор песен Панди Лачо (автор песен Албании на Евровидении 2005, 2007 и 2008) и ведущая RTSH Блерта Тафани, а актриса из Косово Греса Палласка, которая должна была стать третьей соведущей конкурса, не смогла принять в нем по причинам занятости в других проектах. В первые два полуфинальных вечера были представлены по 15 песен, из которых 11 вышли в финал. Таким образом, в финале встретились 22 участника. Приглашение к участию в отборе было опубликовано 8 августа. Заявки принимались телеканалом RTSH 29 и 30 сентября. Артисты и композиторы, желающие принять участие в фестивале, могли подать только одну заявку, а поэты-песенники - заявить до двух песен. Из 70 заявок, поданных вещателю, 30 были выбраны для участия в конкурсе. Radio Tirana в декабре дало своим слушателям возможность услышать студийные версии участвующих песен, что было сделано впервые, и нацелено на повышение интереса к фестивалю. Песни и интервью с участниками можно было услышать ежедневно с 4го декабря в 18:00 Москвы в программе Gjithçka Shqip с ведущими Андри Жаху и Артемисой Дед (онлайн). Все песни также были представлены на сайте фестиваля: 1й полуфинал, 2й полуфинал. Беса Красниджи, шведско-албанская певица, наиболее известная в Косово, стала первой шведкой, принимающей участие в Фестивале. 19 из участников этого года уже выступали в фестивале по-меньшей мере один раз с 2003 года, когда он стал официальным отбором на конкурс Евровидение. Энтела Жула и Козма Души принимали участие с 2003 года по пять раз. Флака Крелани, Клайди Мусабеллиу и Эванс Рама - участвовали по четыре раза. Также в числе участников есть два бывших победителя Фестиваля - Адриан Лулгьюрай (победил на Festivali I Këngës 51 вместе с Бледаром Сейко) и Луиз Эйлли (победил на Festivali I Këngës 44). 26 ноября Эдеа Демалиай снялась с участия в фестивале, поскольку организаторы отказали ей в возможности заменить ее песню "Era" (Adrian Hila - Pandi Laço). В списке участников ее заменит Оргеса Заими. В состав профессионального жюри, которое оценивало выступления участников, вошли: Ilirian Zhupa (поэт), Piro Çako (автор песен), Helidon Haliti (художник), Françesk Radi (певец), Olta Boka (певица), Jehona Sopi (певица) и Alban Nimani (солист группы "Asgjë Sikur Dielli"). Албанский скрипач Шкелзен Доли, участник оркестра Венской государственной оперы и филармонии, а также Aleksandër Gjoka, Redon Makashi, Françesk Radi, Luan Zhegu и Mefarete Laze стали специальными гостями финального шоу, в то время, как выступление победительницы Евровидения 2014 Кончиты Вурст было отменено в последний момент уже второй год подряд. Финальное шоу вышло также в эфир каналов RTK (Косово) и MRT2 (Македония). Tale of love, the message is Love can bring change. Чтобы понять, что это значит.